In a way, it is surprising that it has taken this long to post WALL-E. My 3 year old has been watching this pretty consistently for the past six months. I’ve been seeing it in pieces (though I’ve seen it twice before). With the kids recovering from the flu, today was the first day he and I sat down and watched it straight through, beginning to end. A few spoilers below. I watched WALL-E (2008) on 1.29.14. It was my third viewing of the film and first since ’08. On the surface, WALL-E is the story of a robot (surprisingly named WALL-E) who roams the Earth completing his duties. It has been 700 years since mankind left the planet, and WALL-E seems to be last operational machine. He spends his day slowly cleaning up and organizing trash. He finds curiosities and pieces of himself (for repair as needed) and keeps it all in his home. His tranquility is interrupted when another robot, EVE (but pronounced Eva, as to avoid being TOO obvious a biblical metaphor) arrives to look for life. She finds that WALL-E has a plant, and soon they are whisked away to the spaceship Axiom which is one of the last bastions of humanity. The ship’s captain (voiced by Jeff Garlin) has a directive to return to Earth upon the discovery of plant life. The ship’s AI has other ideas. So if the plot has to do with the delivering of a plant to the proper place, themes and messages of this film are so much more. First of all, the concepts of corporate totalitarianism ruining the Earth in 100 years are front and center. The company of choice is Buy-N-Large, or BnL. The Earth they left behind has the BnL logo everywhere. BnL is the store, BnL is the bank, BnL is the transit. The messages about leaving the Earth are provided by the CEO of BnL, rather than a government leader. In fact, it would seem that the corporation has replaced government all together, with a later emergency message being given by the same CEO in front of a podium and logo which mirrors the colors and design of the White House. Interestingly, this CEO is human. This is the only time in Pixar features, to date, in which a human is depicted as human and not animation. Later we see a wall of the Axiom’s captains over the course of 700 years. The wall shows a human who slowly becomes an animated being. The reliance on machinery and selling out to corporations will take the humanity out of us, according to the film WALL-E. (This also has implications when considering the theory that all of the Pixar universe is one large story. I think it actually proves that Jon Negroni has the order wrong, at least. To read more about that, go here). There is an interesting thread about WALL-E introducing humanity to humans. WALL-E himself has learned about humanity by watching the musical HELLO, DOLLY! over and over. When he gets on the Axiom he is the chaotic variable which, quite literally, throws everything off line. People notice themselves, their surroundings, their humanity. While this is happening, WALL-E himself is attempting to make a human connection, specifically to hold hands, with EVE. His failures frustrate him in a human way. This connection, ultimately trumps his programming in the final moments of the film to return his, for the lack of a better word, soul. If there is anything to put down in this film, it might be the reliance on coincidence to move plot. However, because the dialogue and character are so strong, the coincidences are absolutely forgivable. Indeed, there is much to love about this film. 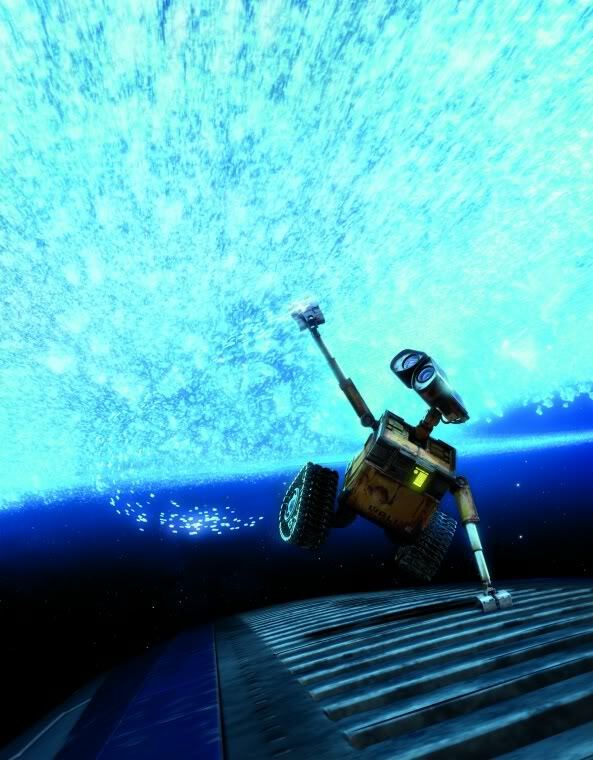 An outer-space flight dance between WALL-E and EVE may be one of the most visually satisfying sequences in animated film history. The childlike quality of WALL-E makes him immensely likable, even as he says little. We want him to succeed. When the light goes out of his eyes we feel it. The magic of Pixar is that they, under the Direction here of Andrew Stanton, have managed to create such wonderful character in WALL-E that we can actually feel the moment that he goes vacant. Not only is WALL-E the best animated film of the 21st century, an may be the best animated film of all time, but it stands up against any film in recent memory in terms of thematic, entertainment, and aesthetic value. That it manages to make me feel that way while also thoroughly satisfying my three year old son goes to show why Pixar is among the best film studios working today. When considering an animated film, the ACTING score factors in both voice over work and the animation to make a judgment on total character creation. The bonus point is for the music, both score and soundtrack, utilized to great effect throughout the film. Through 621 films scored on this site in the last five plus years, WALL-E ties for fifth all time highest score. ~ by johnlink00 on January 29, 2014. Agreed on all points. This film is terrific. Such a wicked film. Definitely one of my favourite Pixar films. Nice write up man. Thanks! I need to rewatch Up. I liked that one a ton and haven’t seen it since theaters. Monsters Inc may be the most enjoyable, but Wall-E is the best. Count this one for Anti-Shitfest 2014.